German philosophical writer; born March 27, 1864, at Hirschberg, Silesia; son of Rabbi H. Joël of that city and nephew of David and Manuel Joël. Educated at the gymnasium of his native town and the universities of Breslau and Leipsic, he graduated as Ph.D. in 1886. The following year he went to Basel, where he was admitted to the philosophical faculty as privatdocent in 1893, becoming assistant professor in 1897, and professor in 1902. 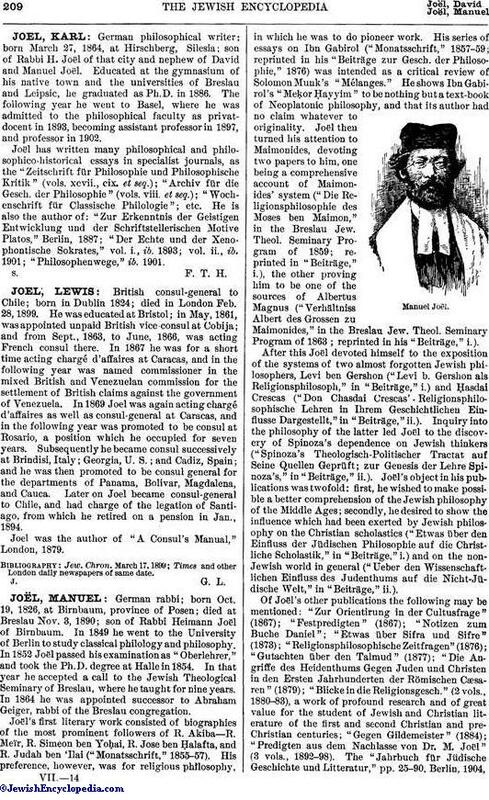 Joël has written many philosophical and philosophico-historical essays in specialist journals, as the "Zeitschrift für Philosophie und Philosophische Kritik" (vols. xcvii., cix. et seq. ); "Archiv für die Gesch. der Philosophie" (vols. viii. et seq. ); "Wochenschrift für Classische Philologie"; etc. He is also the author of: "Zur Erkenntnis der Geistigen Entwicklung und der Schriftstellerischen Motive Platos," Berlin, 1887; "Der Echte und der Xenophontische Sokrates," vol. i., ib. 1893; vol. ii., ib. 1901; "Philosophenwege," ib. 1901.